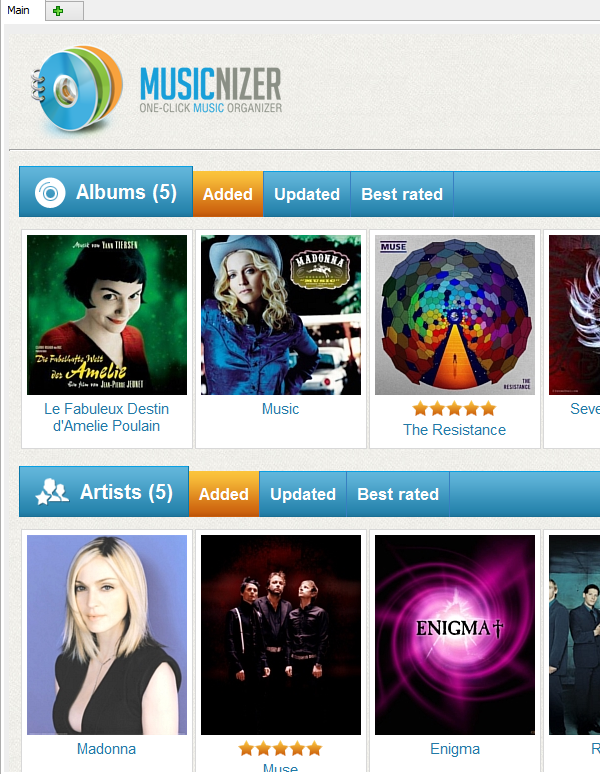 Musicnizer uses a database engine to work with information about music albums and artists. Using a database allows processing huge numbers of records without a significant impact on performance. The complete database is stored as a single file with the .dmu file extension. Album covers, photos of artists and other images are stored separately, in the "Covers" subfolder. If you copy only the .dmu file without the "Covers" subfolder and try opening the copy, no pictures will be displayed, but the rest of information will be there. It's a few music albums and a few artists. You can use this database to test various features of the music organizer, see, how various fields are used, etc. Once you decide to start adding your own albums, it's time to create a new database. Select "File" - "New database" and enter a name for your future database file. The database file can be saved in any folder on your computer or in a network folder. The latter option is not recommended, as the program will work slower if it has to communicate with its database over a network. The program changes filenames of demo databases in order to prevent overwriting an existing database with valuable information, so if you uninstall and reinstall Musicnizer several times, you may get several demo database files in the folder. Now you can easily copy the .dmu file and the Covers subfolder to create a backup copy or move the data to a different computer. Alternatively, you can use the backup/restore feature of the program. As we have already mentioned, copying only the .dmu file will result into a database without pictures, so do not forget to copy the "Covers" subfolder.